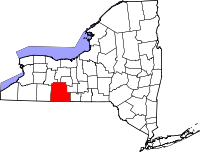 Steuben County is like the vast majority of counties in New York State that have local historians within most of the towns and villages within its borders. Similarly, birth, death, and marriage records are collected and maintained at the local town level by the clerks of each respective town where the events occurred. Birth records become open to the public upon reaching 75 years of age, and death records upon reaching 50 years. Until then, only the original recipient or those with a vested interest, such as members of the recipient's immediate family, may obtain certified copies. The Steuben County Historian's website provides a listing of area historians for each town within the county that has them, along with their contact information and specific address. The Historian website also contains a fair amount of information and records as well as detailing the office's holdings at its physical location.